Burritos, tacos, donuts, tacos, sandwiches, tacos, hot dogs, tacos, sushi, tacos, fresh popsicles, tacos… and did I mention more tacos? Believe it or not, I’m not listing the menu for your local Taco Bell. Frolic my fellow Akronites to Akron Food Truck Fridays! Get ready for some excellent mobile eats! The food trucks can be found at 18 North Forge Street in Akron every Friday afternoon from 11 a.m-1:30 p.m. beginning May 16 through September 12 (so there are three more Fridays left!). As our resident vegetarian, I can personally vouch for the tacos at Wholly Frijoles. They are stellar! Ian and Pat both went to the Stone Pelican Rolling Cafe for a deli style sandwich. And if you like seasoned fries, it’s the food truck for you. To top it all off, we all stuffed ourselves with crepes for dessert. What’s even tastier is that the event supports a good cause. 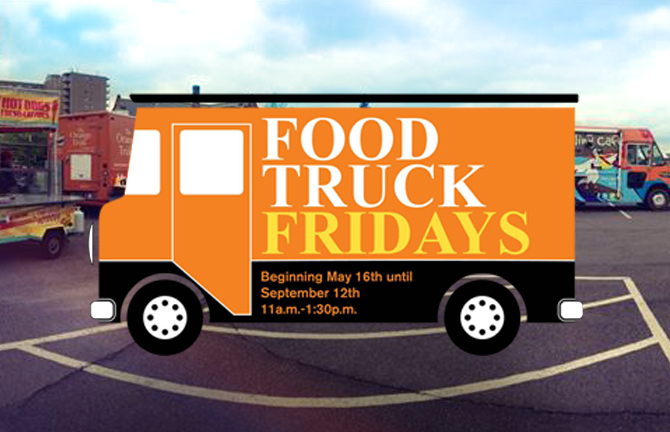 Food Truck Fridays is a fundraising event that benefits Child Guidance & Family Solutions. They are a local nonprofit that primarily serves children and youth who reside in Summit County. Focusing on behavioral and mental health, they offer services to all children with social, emotional, behavioral and/or mental health difficulties. They have five locations throughout Summit County. Is your mouth watering yet? I wonder if they can cater for our office? I’m hungry for lunch already… and it’s only 9 a.m. What can I say, I like to plan my meals in advance! So I hope to see you this Friday enjoying food tacos soon! Thank you Child Guidance & Family Solutions for the lunchtime fun.